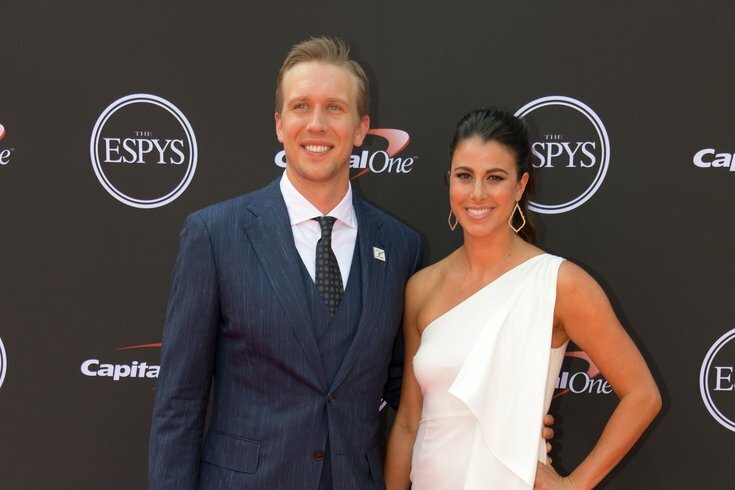 Philadelphia Eagles quarterback Nick Foles and wife Tori Foles arrive for the 2018 ESPYS at Microsoft Theatre. Philadelphia Eagles quarterback Nick Foles can add another award to his trophy case this year. The Super Bowl LII MVP earned "Best Championship Performance" honors at the ESPY Awards on Wednesday night. Foles beat out Villanova's Donte DiVincenzo, Golden State Warriors’ Kevin Durant, and the Houston Astros’ George Springer for the award. "We faced so much adversity this year, we have an amazing team," Foles said during his acceptance speech. "It's so much fun to go to work in that locker room every single day. I couldn't have done it without y'all." "I mean, we see what happened," he added. "We won the first Super Bowl in Philadelphia history, so we got a special group of guys." Foles even gave Philadelphia fans a special shoutout during his speech, saying we get a bad reputation, but it's the "passion" that keeps the team going. "Y'all bring it every single day, so thank y'all," he said. And in typical Foles good-hearted fashion, he ended his speech encouraging all of the kids watching the show, telling them to pursue their dreams. "Go out there every day and be bold," he said. The Birds were also nominated for "Best Team" but lost out to the World Series champion Astros.